Allen Bestwick will be the play-by-play announcer for ABC’s broadcast of the Angie’s List Grand Prix of Indianapolis alongside analysts Eddie Cheever and Scott Goodyear. Pit reporters are Rick DeBruhl, Dr. Jerry Punch and Jon Beekhuis. Radio Broadcasts: The Advance Auto Parts INDYCAR Radio Network is led by chief announcer Mark Jaynes, w/analyst Davey Hamilton. All Verizon IndyCar Series races are broadcast live on network affiliates, Sirius 212, XM 209, IndyCar.com, indycarradio.com and the INDYCAR Mobile app. * Simon Pagenaud continued his hot start to 2016, claiming his second win of the season at the Honda Indy Grand Prix of Alabama on April 24. Pagenaud, who won the Toyota Grand Prix of Long Beach on April 17, increased his points lead over four-time series champion Scott Dixon to 48 heading into this weekend’s race. * The Angie’s List Grand Prix of Indianapolis will be the third Indy car event conducted on the Indianapolis Motor Speedway’s road course. * Pagenaud and Will Power are the only drivers to have won on the Indianapolis Motor Speedway road course. Pagenaud won the inaugural race in 2014, Power won the race in 2015. * Power is the only driver to win the race from the pole, winning in 2015. 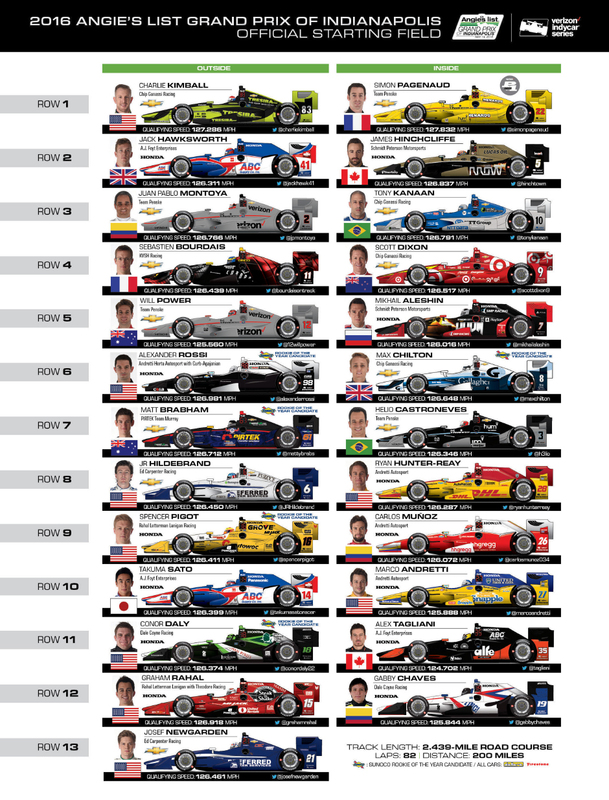 * Sixteen drivers have competed in every Indy car race on the Indianapolis Motor Speedway road course – Marco Andretti, Bourdais, Helio Castroneves, Dixon, Jack Hawksworth, James Hinchcliffe, Ryan Hunter-Reay, Tony Kanaan, Kimball, Juan Pablo Montoya, Carlos Munoz, Josef Newgarden, Pagenaud, Power, Graham Rahal and Takuma Sato. All are entered this year. 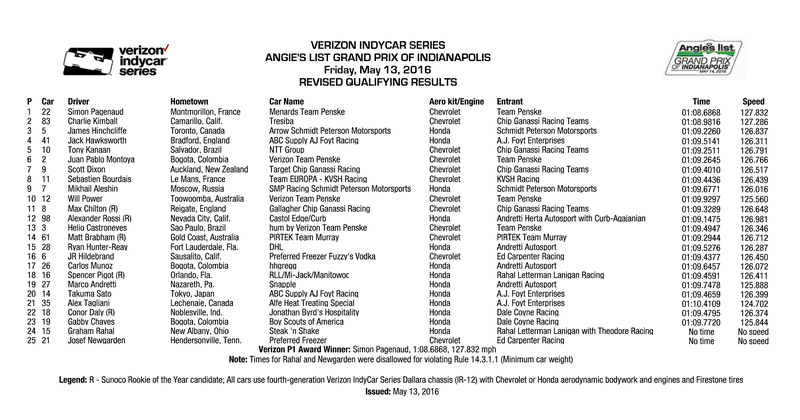 * Indy car veteran Alex Tagliani, rookies Matthew Brabham, Max Chilton, Conor Daly, Spencer Pigot and Alexander Rossi will compete in their first Verizon IndyCar Series race on the Indianapolis Motor Speedway road course. Brabham, who makes his Verizon IndyCar Series debut, won an Indy Lights race on the track in 2014. Chilton, who leads the Sunoco Rookie of the Year standings by five points ove Rossi and Daly, had a podium at IMS in Indy Lights in 2015. * 2016 is the second year aerodynamic bodywork component kits are used. Aero kits, produced by engine manufacturers Chevrolet & Honda for their respective teams, are the latest technical innovation to enhance on-track performance through competitive aerodynamic development. Each manufacturer produces two kits for teams – one for short ovals/road courses/street courses and another for superspeedway ovals – within each kit, teams have multiple component options available.